Photo by Alex Caparros/Getty ImagesLionel Messi. 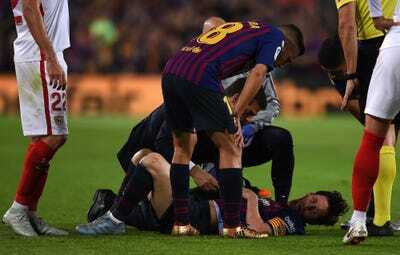 Lionel Messi has fractured his arm one week before the biggest match of FC Barcelona’s season so far. The injury occured after just 17 minutes of Saturday’s La Liga game against Sevilla. Sadly 15 minutes of Messi is all we’re going to get. Looks like he’s seriously damaged his arm…may be broken. Messi got tangled up, fell over Vazquez’s leg, and landed awkwardly on his arm with his right elbow bending in the opposite direction to his body. The injury leaves FC Barcelona without its best player one week before its biggest match of the year so far – the highly-anticipated El Clásico against bitter rival Real Madrid on Sunday, October 28. Prior to the Sevilla game, Messi was Barça’s standout performer with an overall La Liga rating of 8.43 from eight outings,according to statistics website Whoscored.com. As Barcelona’s next best player is Philippe Coutinho with a rating of 7.35, Messi’s absence will be felt.